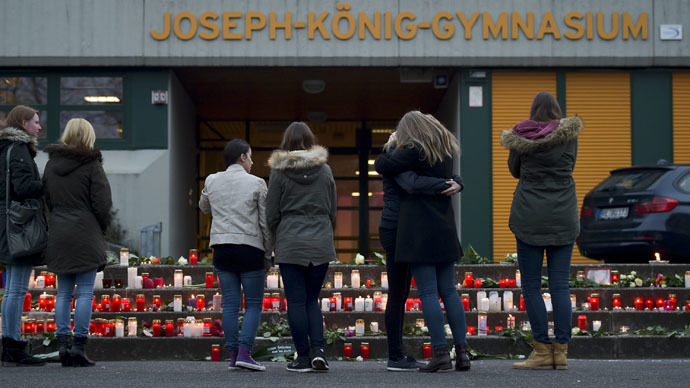 Schoolchildren in the German town of Haltern wept openly and lit candles for 16 students and two teachers who died when their plane crashed in the Alps on Tuesday. They were returning from an exchange trip to Spain. 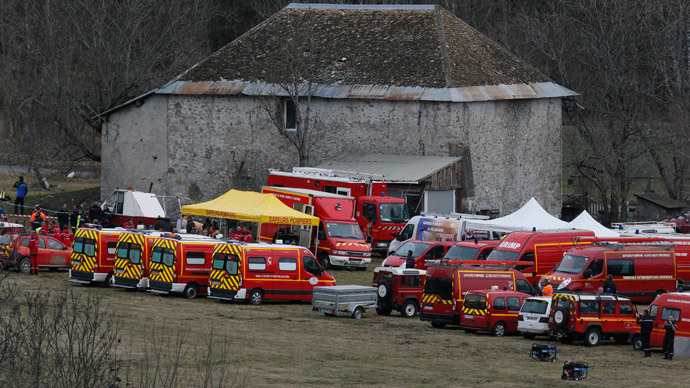 "It's the darkest day in this town's history," said Bodo Klimpel, mayor of the town of less than 40,000 people, as he tried to fight back tears. "We're in a state of shock. It's the worst thing ever imaginable." The 10th grade students – aged 15 and 16 – from Josef Konig Gymnasium were due to return through Dusseldorf airport on Tuesday afternoon after a Spanish-language exchange trip to Barcelona, where they had spent the past week. Rumors began to spread throughout classrooms, and children attempted to contact their classmates. "And then when the plane didn't land and they were unable to make contact with their friends and classmates by cell phone, that's when they assumed the worst had happened," said Klimpel. As footage of the plane – “pulverized” on impact when it hit the side of an Alpine mountain – began to filter through, all classes were called off. About 100 people then gravitated to the courtyard – some talking, others just standing in silence. "It was crazy. Many peopled started weeping at the same time and many were distraught," an 11th-grader told NBC News. A stone slab traditionally used for playing table tennis soon became filled with flowers, candles inscribed with the names of dead friends, and personalized condolences. "They were flying home after having what was probably the most wonderful time of their lives," said Sylvia Loehrmann, the education minister for the state of North Rhine-Westphalia, where the school is located. "It's so tragic, so sad, so unfathomable." The school has decided to open on Wednesday without classes, to let the students and staff grieve if they want to come in. Llinars del Valles, the Catalan town of 9,000 that hosted the children, was also in mourning, as its families were the last to see the children alive. 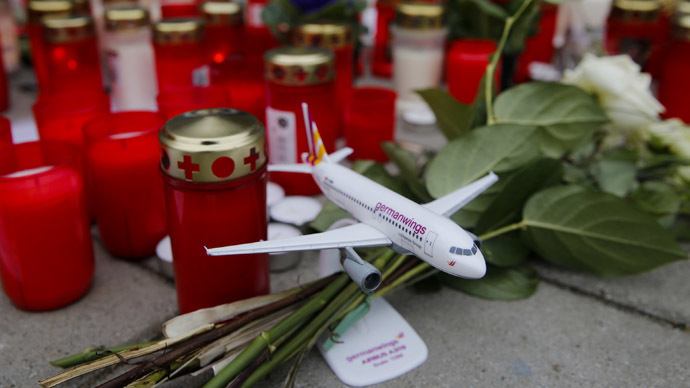 All 150 people aboard flight 4U9525 died, 67 of whom are reported to be German citizens. 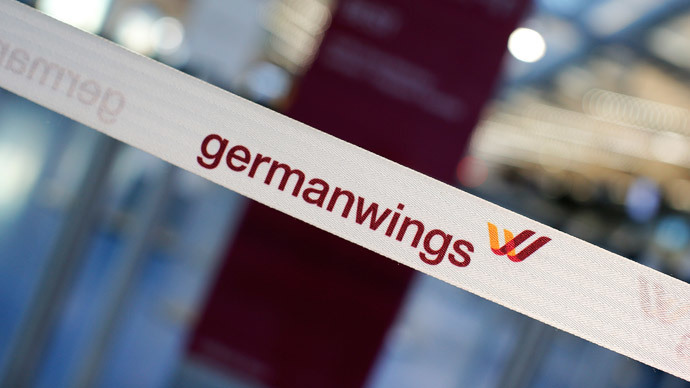 The plane – operated by Lufthansa’s budget subsidiary Germanwings – gained altitude after leaving Barcelona, before apparently plummeting downwards for eight minutes and colliding with an Alpine mountainside on the French border.